Imagine a road trip whose route crosses a couple of 7,000-foot mountain passes. It includes two-lane roadways with both long, straight stetches and sinewy, steep mountain curves. Think of a route that passes by Area 51, the primary Predator airbase, several historic gold and silver mining areas, and winds by a grove of the oldest trees on earth. Such a drive is an easy day trip from Las Vegas, Nevada, and covers about 262 miles one way. Departing Las Vegas on US-Hwy 95,a four-lane road passes through the Las Vegas Paiute Indian Reservation (and past a funny sign!). 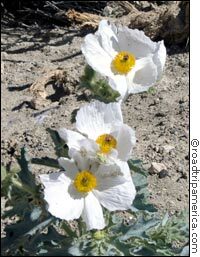 On the east side of the highway is the majestic Sheep Range and the Desert National Wildlife Range. Even though these mountains nearly touch the northern edge of Las Vegas, they remain one of the least visited preserves in the country. Indian Springs Air Force Base is the primary training facility for the Predator (unmanned aircraft) program, and, like other times when we have been here, we spied a Predator flying just north of the highway. Just west of the air base is the former small town of Cactus Springs, notable for the Sekhmet Temple, which is visible from the road on the south side of highway. The four-lane divided highway ends at the turn-off for Mercury (a restricted gateway to the famous Area 51), and the road becomes a two-lane adventure for the rest of the trip. When you see the Jackass Aeropark sign, you will have reached Lathrop Wells, which has a decent roadside rest area and a couple of convenience stores and gas stations. Continuing north on US-95, evidence of extensive mineral mining, long a hallmark of economic development in Nevada, appears. One of our favorite sites is the Carrara marble quarry site at mile marker 51. Beatty, Nevada, is a vintage mining town, full of charm and great place to grab a quick meal. There's a local historical museum, the Department of Energy's Yucca Mountain Science Center, and a visitor center for nearby Death Valley National Park. If you have time, a side trip to the ghost town of Rhyolite can be a memorable experience, especially near sunset. 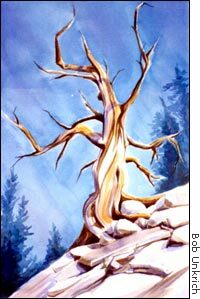 Since we were on a mission to see the famous Bristlecone Forest in California's White Mountains, we pressed on. Shortly after cresting the 4,690 foot Stonewall Pass, we turned west on County road 266 at Lida Junction. Evidence of mining activity is all around the small community of Lida, which was a historic meeting place for the Shoshone and Paiute Indian tribes and a fairly large boomtown in the 1860's. Palmetto, named by the 1886 silver miners who thought Joshua Trees were a kind of palm tree, is another historic mining district. As the road descends into California, it passes through the rich agricultural area known as Fish Lake Valley. Surrounded by the brown desert hills, the green alfalfa fields look like a lush oasis. The road that climbs out of the Fish Lake Valley is fun to drive! 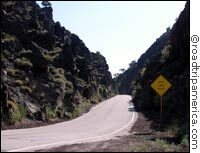 It has lots of curves, tight angles, and an 8% grade culminating at Gilbert Pass (6,374 feet). Past the summit, it's time to put the hammer down and zoom across the Deep Springs Valley. Then gear up for the 9% grade climb up to the 7,313-foot Westgard Pass. Shortly after the pass, we came to White Mountain Road which provides paved access to the Schulman Grove and Visitor Center at the Ancient Bristlecone Pine Forest. This road is about 10 miles long and winds its way up the mountain providing awesome viewpoints of the Sierra Nevada eastern slope. There is another dirt road (about 13 miles long) from the visitor center up to Patriarch Grove, where a number of the oldest known living trees live. "Methuselah" a bristlecone (Pinus longaeva) pine tree within walking distance from the visitor center, is estimated to be at least 4,770 years old. Although we didn't take the time to drive up to the Patriarch Grove, we did walk the Discovery loop trail and saw a number of trees that were at least 4,000 years old, including a stump of a tree that died in 1676. 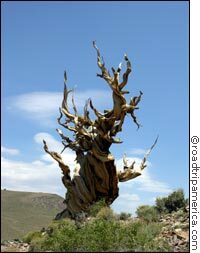 Because of the high altitude (10,000-11,000 feet) and a harsh environment with highly alkaline soils, which only allows a yearly growing season of about forty-five days, these trees grow very slowly and produce very dense and resinous wood that is very resistant to rot and disease. These harsh conditions produce gnarled and twisted trunks that seem almost surreal. Especially in the changing light, they are arrestingly beautiful and, not surprisingly, popular with landscape artists and photographers. Rather than drive back to Las Vegas in one day, we retraced our path back to County road 168 and headed down to Owens Valley and Big Pine, California. Along the way we drove along the former Deep Springs Valley Toll Road, also known as the "Midland Trail" which was one of the last privately held toll roads in the West. At one place the road narrows into one lane, appropriately called "the Narrows". Because this is the primary haul road for the alfalfa-laden trucks headed west from the Oasis Ranch at Fish Lake Valley, it is good idea to approach this one-lane road with caution. This is a great drive for anyone and a special favorite among motorcyclists. With roadside wildflowers, ancient forests, curvy mountain roads, wide open desert landscapes, and historic building and artifacts, it truly has something for every road trip enthusiast. 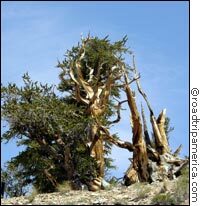 Visit the Ancient Bristlecone Pine Forest online.